When Apple announced Metal for MacOS it promised a new era in Mac gaming performance. Unfortunately, almost two years passed before we saw the payoff, and aside from hating to wait, it also led to delayed top-tier games while companies had to wait until the API was mature enough to implement. In the spring of 2017, the wait was finally over and an avalanche of both AAA and excellent independent MacOS Metal games quickly followed. And with the recent announcement that Apple will deprecate OpenGL soon, Metal is clearly the future of Mac gaming. ⚠ Remember that if a game requires Metal, it will require a Mac from 2012 onwards, except MacBooks (2015 or later) and Mac Pros (2013 or later). This list has been updated with the addition of Rise of the Tomb Raider, Thrones of Britannia and the improved Vulkan-based version of Dota 2. Also, Space Pirate Trainer was added to our upcoming section. These are the games that currently use Metal’s API and officially support it. Those that support Metal in beta form can be found in a later section. The second installation in the rebooted Tomb Raider series, Rise of the Tomb Raider (RotTR) was inevitable after the success of the first game. And while the familiar elements are still there, there’s also plenty that’s new. Two of the biggest are some RPG elements and crafting being added in addition to the exploration and fighting we’re familiar with. You start out in Siberia and this time you’re on a quest to find a hidden city which may contain the secret to immortality. Using the familiar 3rd person perspective, you’ll explore, fight (including your bow of course) and get a chance to raid some tombs. Also featuring additional gameplay modes, RotTR is a worthy sequel and keeps the franchise going strong. Rise of the Tomb Raider is also a beautiful, graphics-intensive game. So unless you have a recent, high-end Mac you’ll want to check our performance review to see if your Mac can run it; simply supporting Metal (most Macs since 2012) is not enough anymore to guarantee an enjoyable experience. If you pay any attention to this site at all you know we’re fans of the Total War series. So the announcement of the Total War Saga series, focusing on specific turning points in history, had us intrigued. The first in the series is Thrones of Britannia, set in the British Isles in 878 A.D. as competing factions vie for control of the islands. Smaller in scale and scope than other Total War games, Thrones of Britannia allows you to play as one of ten different factions in your quest to unite the isles under your rule. Featuring the familiar Total War combination of turn-based strategy and real-time battles, you’ll find it easy to jump into if you’ve played a Total War game, but as a smaller game, you’ll find things missing or limited such as city building and building customization. As always, Feral Interactive has done a fantastic porting job, meaning Thrones of Britannia can be played on a variety of Macs. Our only question now is: Where’s Total War: Warhammer 2? DiRT Rally is Codemasters’ latest racing game to arrive to macOS. DiRT Rally has won high praise for its realism, although this includes cautions that it is a deucedly difficult game to master. That’s what comes from being the most thrilling and authentic rally racing game out there. DiRT Rally features three different disciplines: Rally, Rallycross and Hillclimb; 45 cars to choose from; and cross-platform multiplayer with Windows & Linux. You also get 70 stages around the world, multiple tracks in each location, and the ability to fine-tune your car just the way you like it. It’s exhausting reading about all this game offers, much less playing it. DiRT Rally will give you hours of off-road racing challenges and as an added bonus, the system requirements are not that steep: pretty much any Mac that supports Metal can run it. Considered by its creator a spiritual successor to the classic Myst, in The Witness, you wake up alone on a mysterious island with no memory of who or where you are. To solve these mysteries and find your way home you'll explore the island and be challenged with a series of puzzles. As you solve the puzzles you will solve the mysteries as well. One of the first of the spring of 2017’s onslaught of Metal Mac games, The Witness is a Mac App Store Editor’s Choice which has been praised for its beauty and difficult but solvable puzzles (and lasers!). Featuring an open-world island to explore, The Witness emphasizes line puzzles and a story that some find philosophical while others find pretentious. Everyone agrees it’s a gorgeous game though, worthy of being compared to Myst and its successors. The Witness requirements are modest and should run on most Macs released since 2012. Blizzard’s World of Warcraft has a special place in our hearts as the first game released with Metal support. Though a (much) older game, last year’s Legion expansion breathed some new life into this venerable MMORPG, and Metal support has made a huge difference in the game’s performance, as you can see from our benchmarks. And while player numbers are certainly down from their peak, there are still plenty of people logging on to what is probably the most popular MMORPG of all time. Furthermore, as an older title, the system requirements are somewhat modest and, despite its age, you're still looking at one of the best MMORPG’s around. Most Macs from the last several years should be able to run WoW, including your older MacBook Metal just enhanced. A fantasy MOBA from Valve, Dota 2 has been around for several years but in February they announced they would be adding Metal support through a MoltenVK/Vulkan implementation. And it looks like Metal support should be coming to all future and maybe some other popular existing Valve games. A true free-to-play game, Dota 2 is one of the most popular MOBAs around, although as is often the case there are concerns about both a toxic community and abuse of the reporting system. Nonetheless, the game still sports an 87% overall positive rating on Steam and an average of almost half a million players online at any one time. A bit difficult to get into, Dota 2 features cooperative play, the ability to play against bots as you learn the ropes, and a balanced matchmaking system. As an older game, Dota 2 is also a winner for its ability to run on most Macs that support Metal. Of all the announced games we’ve been anxious about for months, this was the biggie. While Feral did a decent job of keeping us up to date, at least confirming that it was still on the way, it took a disturbingly long time for Deus Ex: Mankind Divided to make it to MacOS. As you might expect, the latest in the Deus Ex franchise was waiting not just for a mature Metal, but for Metal 2.0. This installment continues the franchise’s excellent story and open-ended gameplay. In the latest edition, augmented humans such as yourself have become outcasts, segregated from the rest of society. As in previous entries, you choose how to upgrade your augmentations and how to play the game: stealth, barrels blasting, hacking, etc. In fact, the ability to choose how you play through the game has always been one of the franchise’s most outstanding features. How you approach both missions and upgrading your augmentations is paramount. As you might expect, DE: MD comes with some hefty system requirements. While the game looks gorgeous, you're going to need a fairly recent machine to play it, or maybe it’s the perfect reason to get a new iMac Pro. Download it from Humble Bundle. Total War: Warhammer was one of those AAA games that was delayed while waiting for Metal support. But Feral was right when they told us Metal was a game changer. The delay was worth it as Total War: Warhammer didn't disappoint once it was released. Taking all that’s good about the Total War series and setting it in the Warhammer universe, this is a game with something for everyone.Total War: Warhammer is the first Total War game not set in a historical period. That said, it’s still a Total War game, with both turn-based strategy and real-time battle modes. Just this time with a heavy mix of fantasy, including gigantic monsters, flying creatures, legendary heroes and more. So if you're a fan of the Total War franchise (I personally own three… so far), the Warhammer universe, or fantasy games, this game is for you. Unfortunately, multiplayer isn't cross-platform, but it does include a co-op mode. Total War: Warhammer requires a recent Mac with a powerful graphics card; you can check Steam or Feral’s website as they’re very specific on which graphics cards work and which work but not well. If you’re as old as I am you remember how groundbreaking it was when Myst came out. Sure it may have been made in HyperCard, but it had 3D generated scenes, QuickTime and an amazing puzzle-based story. It was groundbreaking and essentially created a new genre of video games. Well, Cyan, the team behind Myst, is still around, and their latest game builds on everything they've done before. Obduction takes place in a mysterious world to which you are abducted. In traditional Cyan fashion, your goal is to solve the mysteries of the world in order to find your way home. The game continues Cyan’s tradition of beautiful games with great stories, engaging characters and challenging puzzles. Initially released for VR systems, Obduction is everything good about the puzzle-adventure genre that Myst pioneered and all it requires is a machine that supports MacOS 10.12.4 (Sierra). Just a few months after F1 2016’s glorious surprise, we not only got F1 2017, we got it on the same day as everyone else. Including all the realistic racing goodness of 2016, F1 2017 also includes classic F1 cars from the past 30 years, a deeper career mode, and more gameplay options. All of this allows it to easily retain the crown of the most realistic F1 racing game ever. F1 2017 allows cross-platform multiplayer with Windows while including female driver avatars for the first time. Also new are some alternative track layouts and the ability to customize both the look and makeup of your car even more than before. What’s not new is that even more so than F1 2016, F1 2017 requires a Mac from the last few years with a powerful graphics card. In today’s gaming world you might think that a non-violent platformer that admits to only having about 30 minutes of gameplay would be mercilessly criticized. You'd be wrong. Refunct is one of the most positively reviewed games you'll find, and you can't beat its $2.99 price tag. An open-world platformer where your job is to restore a beautiful world, Refunct doesn't try to be more than what it is, and that’s why it succeeds. Featuring beautiful graphics, great music, and gameplay that plops you into the, well action isn't quite the right word, but game anyway, Refunct is the game to go to when you want to have some relaxing playtime on the computer. And if it wasn't for World of Warcraft, it would have been the first Mac Metal game ever. At this point, the only question is, where’s Refunct 2? Refunct system requirements are modest, any recent machine will suffice. As you might expect from the title, Ballistic Overkill is a fast-paced, multiplayer FPS, with a focus on jumping into the action and shooting. With seven classes, over 80 weapons, 10 maps and four game modes, Ballistic Overkill aims to give you your online shooter fix as quickly as possible. That said, make sure you have a good internet connection: there are many complaints of game-killing lag, and also some concern over the lack of players online, making balanced match-making difficult. If you're looking for a good looking shooter with cross-platform multiplayer, it’s easier to jump into this than on similar games such as Team Fortress 2 or Call of Duty. The game has a much smaller hard drive footprint than those games and modest system requirements. Shooter fans on older machines, you might want to take a look. The latest in the famous series of real-time strategy games, in Dawn of War 3 you play as the heavy-hitting Space Marines, the savage Orks, or the technologically-sophisticated Eldar, in huge battles where you control whole armies, special elite squads, and huge hero characters. In this edition of the franchise, you battle on the mysterious world of Acheron, seeking a special weapon. The game features single player and multiplayer, although multiplayer is only cross-platform between Mac and Linux. While receiving generally positive reviews from the gaming press, user reviews have been mixed. Some complained about a simplified game compared to previous entries, bugs, and a limited single-player campaign. Despite being a newer game with beautiful graphics, system requirements are modest and most Metal-capable Macs will run it. Marvel’s Guardians of the Galaxy: The Telltale Series takes place in Marvel’s universe using Telltale’s signature game style. For those who might not be familiar with it, Telltale specializes in choose your own adventure games, with lots of story, choices that affect how the game plays out, and occasional action scenes. They're great casual games for those who favor story over non-stop action; just go in knowing what to expect. Guardians of the Galaxy occupies a space somewhere between the movies and the comic books. You'll play as Quill (Chris Pratt in the movies) as you and the other Guardians discover an artifact of unspeakable power. And while you will face a nasty adversary who also seeks the relic, more interestingly each of the Guardians has their own reason for wanting it, leading to conflict between them. Marvel’s Guardians of the Galaxy continues Telltale’s run of story-rich superhero games that are as fun to watch as they are to play. Another nice thing about these games are the relatively modest requirements; Guardians of the Galaxy requires macOS Sierra, though a dedicated graphics card is recommended. Want to play SimCity but not the lousy version Electronic Arts released and want something newer than the re-released SimCity 4? Cities: Skyline is the game for you. Taking all that was great about SimCity and building on it, Cities: Skyline is what SimCity could have become. For those unfamiliar with the city builder genre, you are the mayor of a city, responsible for all aspects of its creation. This includes providing electricity, zoning for housing, retail and industry, and all the services your citizens expect. And of course you have a limited amount of money, so you have to decide on tax rates as well. Good luck. With a host of official DLC, expansions and user-created mods, Cities: Skylines also runs no risk of becoming stale or confining. Oh, and a level editor. I've also been impressed with how it adds complexity as you play, allowing you to get a handle on things before opening up more possibilities. Metal was added to Cities: Skylines in May 2017, and it appears that it is not required to run it. However, you should have a Mac with a dedicated graphics card as Intel Integrated Graphics are not officially supported. Mafia 3 was Aspyr’s first Metal release. The story takes you back to New Orleans in 1968. You're a soldier back from Vietnam and as you prepare to escape your criminal past, your surrogate crime family is betrayed and wiped out. You must get your revenge by building a new “family” and battling the Italian crime family & corrupt officials with guns, fists and fast cars. This open-world game is about giving you the freedom to explore the city at will and tackle quests in different ways. You can go in guns blazing or use stealth to go unnoticed by your enemies. While winning praise for its story, soundtrack and especially its graphics, even those who enjoy the game continue to experience some bugs. That said, it is considered possibly the most beautiful game on the Mac right now, and Metal no doubt helps with that. Beauty comes at a price, however, and Mafia 3 requires a powerful new machine with a 2GB AMD graphics card. A newer entry in the genre formerly dominated by World War II Online, War Thunder also includes the Korean War era in its air and land combat options. Free to play and offering cross-platform support on MacOS, Windows, Linux, and PS4, War Thunder added Metal support in May 2017. With a huge number of available planes, tanks, and other vehicles, War Thunder offers anything your heart could desire for mid-20th-century combat. War Thunder also features cooperative multiplayer and is under continuous development from the developers and the fan base. Free to play with modest system requirements, what have you got to lose? Download it from theirOfficial Site. If you’re looking for a beautiful rogue-like space shooter, Everspace may be the game for you. Focusing on action and persistent upgrades, Everspace owes some allegiance to FTL: Faster Than Light but with more focus on combat and less on story and exploration. However, when you do get a chance to explore, you may get lost in the beautiful, procedurally generated universe. Everspace does also include crafting and resource gathering, but the clear emphasis is on fighting … and dying. You will die and will have to restart at level 1 (of 7), but your upgrades persist through each spawn, allowing you to progress through the levels. While light in the story department, Everspace is beautiful to look at and just the fix for your single player space combat trigger finger. However, that beautiful universe does require a moderately powerful machine. He’s back and deadlier than ever. That’s right, Agent 47 is back. A bit late coming to the Mac due to Metal, the latest in the Hitman series features six “episodes”, each taking place in a different location. A connected storyline spans across all the episodes and the different methods for completing your missions give it great replay value. For those unfamiliar with the series, you play as an expert but somewhat mysterious assassin Agent 47, tasked with carrying out a variety of different hits. But what makes this series different is that you do not want to go in with guns blazing, if you do you will lose. Instead, the Hitman series places value on scoping out your target and using stealth and strategy to complete your missions as quietly and unobtrusively as possible. In fact, Hitman: Absolution, the previous entry in the series, made my palms sweaty at nearly every mission. Featuring gorgeous graphics, unique gameplay, and as mentioned above, extreme replay value, Hitman is another AAA title that was worth the wait. However, Hitman does require a fairly recent machine with a powerful AMD graphics card. Future Nvidia and Intel graphics support is hinted at but not confirmed by Feral. Looking for another relaxing, casual game that doesn’t task your brain? You might try Fugl, a game where you fly your shape-shifting bird around a procedurally generated world, basically doing whatever you want. Fugl is currently in Steam Early Access but quite playable, though as a voxel game you might wonder why it needs Metal. Presumably, it’s the procedurally generated world that requires this, and while my description may not make it sound like much, people love it. So again, if you're looking for something relaxing and fun, and a game where you can help guide its development, Fugl is worth a look. Fugl’s world requires a moderately powerful machine with a dedicated graphics card and Metal 1.1 support. The world of Metal games really got going in April 2017 with one of the biggest surprises of the year. Feral Interactive dropped F1 2016 on us with nary a warning, and we couldn't be happier to have this franchise back on the Mac for the first time in four years. One of the best rated and most realistic racing games out there, F1 2016 includes the complete 2016 racing season. In addition to its crazy realistic racing and graphics, the game allows you to simulate your team, working with your agent, engineers, and others to become a true F1 champion. Realistic cars, tracks, and racers from the 2016 racing season make this the closest thing to actually racing your own F1 car, and multiplayer rounds things out, allowing you to test your skills against other players. As you might suspect, this does come at a cost in system requirements, with F1 2016 requiring a fairly powerful graphics card with at least 2GB RAM. A throwback title that might make you feel nostalgic for your childhood, Micro Machines World Series brings back this racing title with updated graphics, multiple game modes, and a focus on online multiplayer racing action. Well, one of the modes is racing, but the main focus of the game is 6v6 online multiplayer battles in household “arenas” such as a pool table or a kitchen counter. In these matches, you can equip your car (or tank, or ambulance, etc.) with different weapons such as a Nerf gun as you attempt to knock or blast the other team’s cars out of the arena. While we all love the idea of taking the toy cars from childhood and racing them, or even better, equipping them with weapons and fighting it out, Micro Machines is hampered by difficult mechanics, a limited number of real opponents online, and a lack of any significant single-player mode. It looks great and will run on most Macs from the last five years, but you might be better taking your old toy cars out for another spin. Another from Telltale Games, this time, as you might suspect, in the Minecraft universe. Following the success of Season One, Season Two continues the story with Telltale's trademark choose your, story gameplay. And for a change, this entry is suitable for children. Set in the Minecraft universe but not requiring knowledge or experience with Minecraft to enjoy, you once again play as Jesse and set off on a new adventure. Featuring Telltale’s expected mix of strong story and characters with meaningful choices driving gameplay, Minecraft Season Two continues to delight with its more lighthearted tone compared to many other entries in the Telltale universe. So if superheroes aren't your thing but Minecraft is, this may be the Telltale game for you. As with the other Telltale games on this list, most Metal capable machines should run it, although Intel integrated graphics are not recommended. From the developers who brought you Broken Age and Psychonauts, Headlander is a somewhat Metroidvania-style side-scrolling action game set in an alternative 1970’s world. You play as the universe’s last remaining human (maybe), a disembodied head that docks with robotic host bodies, as you try and save humanity from the deranged computer that currently rules over you. As you proceed, you will pop your head on and off a variety of robotic bodies, unraveling the story and attempting to save humanity. Featuring gorgeous graphics and great sound, Headlander also features great gameplay, with the different bodies you inhabit having different abilities. Headlander also features a story worth paying attention to if you can, what with all the beautiful bouncing lasers and head popping going on. As usual, those beautiful lasers mean you'll need moderately powerful hardware. Mac gamers were surprised and disappointed when the original Batman: The Telltale Series failed to make an appearance on Mac; most of the Telltale Series games have been showing up on our favorite platform, so it seemed an unusual omission. Well, we can rejoice again, as the latest in the franchise, Batman: The Enemy Within – The Telltale Series made its debut on MacOS this summer. Chapters 1, 2 & 3 are available now, with 4 and 5 coming presumably over the next several months, as is the usual way with Telltale games. As with most Telltale games, Batman: The Enemy Within focuses on the story and characters, and while Mac users have experienced some bugginess, it’s winning praise as an improvement over the original. On the other hand, as the game continues the story from the first game, so you may be a little lost starting out. And again with the Telltale games, Batman: The Enemy Within is not recommended for Intel integrated graphics, though otherwise, the requirements are modest. Less a game than, as you might suspect from the name, a Commodore 64 emulator, VirtualC64 creates a virtual environment in which you can run your own Commodore 64 programs. As with any emulator, ROM images aren’t included due to copyright issues, but VirtualC64 gives you a Mac-centric way to get into or back into Commodore 64 gaming or programming.Since version 1.1, VirtualC64 requires a Metal capable Mac to run, but any machine that meets those requirements should be able to run it. Download it from itsOfficial Site. A bit of an odd beast, Fortnite, from Epic Games has a little bit of everything. Released as a paid Beta with a free standalone PvP released in September as Fortnite Battle Royale, the final game is expected in 2018 as a free to play title. Confused? I am a little, but Epic’s pedigree affords them a bit of latitude, and the game, described as a co-op sandbox survival game, certainly looks interesting. Set in a world where most of the Earth’s population has disappeared and zombie-like creatures rain from the sky, you are a commander of one of the survivor’s bases. During the day you go out and scavenge for supplies, craft weapons, and build up your base, while at night the zombies come and attack in waves. Missions cover up to fourteen days in game time, making the title quite the play on words. While there is currently no cross-platform multiplayer, there have been hints that it can exist, so we can hope. Regardless, Epic’s history gives one confidence that this will be one of the top titles of 2018 when released. As a beta title, no official system requirements have been listed yet, but as of now it looks like most Metal capable machines will meet the minimum system requirements; the speed of your internet connection may be more important than your graphics card. You read that right, one of the best shooters ever has been remastered with improved graphics and Metal support, making it both one of the oldest and one of the newest on our list. Including DLC and other content not included in the original release, Bioshock Remastered allows you to return to the beautiful and creepy city of Rapture while taking advantage of your Mac’s graphics capabilities. With 4K resolution support, Bioshock Remastered should appeal to fans of the game wanting to return to Rapture and those who may have never tested the waters but were wary of buying a ten-year-old game when there are newer versions available. While Bioshock Remastered will run on most modern Macs, older ones without Metal are not officially supported by Feral. Observer is a cyberpunk horror game developed by Bloober Team, the creators of Layers of Fears. Set in a post-apocalyptic 2048, you are Dan Lazarski, an elite neural detective known as an Observer. You are part of a corporate-funded police unit whose purpose is to hack and invade suspects’ minds to gather clues and evidence. In this future, anything you think, feel, or remember can be used against you in a court of law. The game takes place in a dark future where drugs, VR, and neural implants ravage the minds of the survivors of plague and war. But as you relive the memories of the criminal and insane, you begin to question how much of your own reality you can trust. Considered by many one the top cyberpunk games of all-time, Observer made our list of the top 20 Mac games of 2017. Featuring the voice of Rutger Hauer (Blade Runner) and a Mature rating for many reasons, >Observer is the game to go to for your horror fix… if you have the computer for it. Observer‘s a gorgeous but graphically demanding game and requires a newer Mac with a 2GB graphics card; porting house Aspyr confirms that the game supports but does not require Metal. These are the games that have confirmed Metal versions coming soon. Some of these even have Metal betas available. Now I’m sure it’s a coincidence, but a few days later Feral Interactive announced that this title is coming to the Mac. No date yet or official system requirements, but based on Feral’s history we can expect a well-optimized port coming as soon as they get it right. TW: Warhammer 2’s campaign picks up after the end of the campaign of TW: Warhammer (which I’m still working my way through). So you’ll have the classic Total War combination of real-time battles and turn-based strategy, huge battles when you get to them, and a nice dose of magic, dragons and other fantasy elements that makes this series stand out from the traditionally history-based Total War franchise. With an 87 score from both Metacritic and Steam reviewers, there’s no reason to believe this won’t be on our Best Mac Strategy Games guide the next time it’s updated. Can you tell we’re excited? Yeah, we’re excited. Finally in full release after being on Steam Early Access since what felt like forever, Ark: Survival Evolved is a couple of different games in one: a single player open world survival game with dinosaurs or an MMO you can play on private or public servers. You begin the game stranded, naked and freezing on a mysterious island. If you survive long enough, you'll work your way up to crafting, farming and, yes, taming dinosaurs and other creatures. This game gives you so much to do. You can use skills, craft, breed animals, ride them, and fight or become friends with other human players on the island. There have been complaints that on the public servers it’s practically impossible to survive any length of time, as experienced players will come and kill you and/or take your stuff. More importantly, both Mac and Linux versions have suffered from poor performance, something we hope Metal will at least partially solve. The most venerable and most realistic flight sim on the market, version 11 also offered a major upgrade of its notoriously unfriendly user interface. If you're unfamiliar with the title, you should be aware that this is truly a flight simulator, and some even argue it’s not really a game. Featuring loads of different aircraft provided for free and a huge developer community with free and paid content, X-Plane provides the most realistic flying experience possible. Depending on your level of interest that can go all the way to setting up your flight plans and contacting control towers just like a real pilot. In fact, more advanced versions of X-Plane (not your desktop versions) can be used for some aspects of pilot training. X-Plane 11 requires only a moderately powerful Mac, but the better your specs the more you can boost up the realism in every aspect of the game (plane details, scenery, cities, etc.). As to Metal, the developers continue to insist that support is coming in X-Plane 11, but have given no time frame. Not only is Arma 3’s Metal support in beta, the whole game is officially called an “experimental” port. It is being developed by porting house Virtual Programming, with no promise of it ever being released in a full version on MacOS. In fact, the only way to get your hands on the Mac version is to own the Windows version. That said, our fearless leader Ric says the game is more than playable on Mac, despite being a non-native port, and that performance continues to improve with 64 bit now supported. Arma 3 is a military simulator, bringing the most realistic fighting experience to players in modern battlegrounds. Very much NOT a Call of Duty clone, Arma puts a focus on realistic combat and tactics in vast battlefields. You might think this makes it a demanding game both for playing and for computers, and you’d be right: Arma 3 requires a modern, powerful machine that supports Metal 2. The sequel to one of the, if not the, greatest RTS games of all time, Starcraft 2 provided the same intense gameplay, while updating the graphics and adding some additional elements such as some non-linear missions, RPG elements, and tweaks to gameplay. While Blizzard received criticism for releasing the game as three separate installments, one for each race, the game nonetheless proved extremely popular. In January Blizzard released an update adding what it’s calling Beta support for Metal, but there has been no word on its development since then. On the upside, as a 7-year-old game, the system requirements are pretty mild and most Macs can run it. And as of November 14, 2017, the first installment, Wings of Liberty, is free to play. Yay! 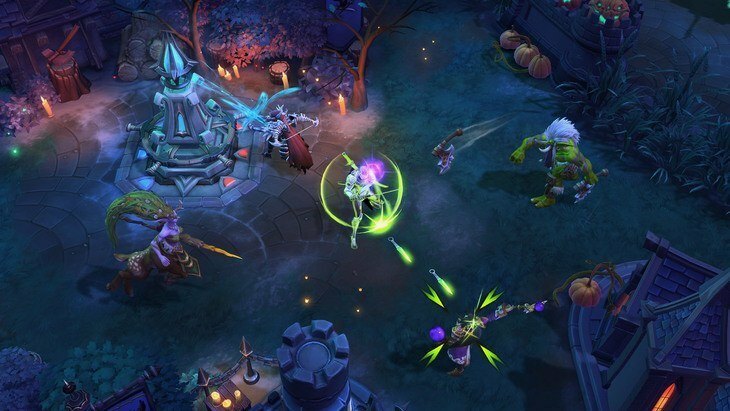 Blizzard’s entry into the MOBA space, Heroes of the Storm brings heroes from various Blizzard properties such as Warcraft, Diablo, Starcraft and others into 5 on 5 online battles. With 71 heroes, 13 maps and a variety of game modes, there’s plenty of variety, and their offering of both free-to-play and freemium models makes the game available to a broader audience. Updated in April to what Blizzard calls Heroes 2.0, elements from Overwatch were brought into the game along with other gameplay adjustments. As with Starcraft 2, beta Metal support was added in January 2017, system requirements are modest, and there is no word on when it might lose that beta moniker. Space Pirate Trainer (SPT) has been on our radar for a year now, since it was demoed at Apple's 2017 WWDC. And while we have confirmation from Unity that it uses Metal and is coming, there’s still little more information than the fact it may be the first VR game to make it to the Mac. Providing what you might expect from its title, SPT has you fighting off waves of droids with guns, dodges, and shields. Boasting a 96% positive rating on Steam, SPT is also known for giving you a good workout while you play. And there you have it. As of publication, this seems to be the comprehensive list of Metal games for Mac. And worry not, as soon as Metal games appear, we will update this list accordingly. Metal is finally delivering on its promise of improved graphics performance for Mac gamers, and game developers seem all on board. Luckily, many other developers and publishers have supported Metal since, proving Firewatch was the exception and not the rule. The only downside with Metal? If you keep your Macs as long as I do, it’s time to start saving for an upgrade as more and more games will require Metal support, leaving anything more than 5 years old, and even some Macs that are newer than that, out in the cold. Thanks, this is a great post for a new Mac gamer. Does using Metal mean that all these games are 64-bit executables and won’t be affected by Apple’s 32 bit cull in a year or two? I can’t say authoritatively yes, but it seems like it must be so as Metal requires 64 bit. Thanks for the information. I am running a 2017 iMac on Sierra. It appears that the Blizzard stable of games are detected as 32 bit applications and not 64-bit as is the case with Windows and even in Bootcamp. Another issue is that High Sierra seems to be killing support for gaming platforms e.g. Steam. What can be done to remedy this, please? Honest question: how is steam support being killed off? Massive worry if so! The new APFS file system is causing issues with many gaming platforms (not just Steam) but I don’t see this a killing everything – developers are actively working to solve this as losing Mac games would kill a lot of their revenue. Not sure I follow, never seen a sign that Steam is in peril. And if there was ever an issue with 32-bit etc, I’m certain Steam will make sure they support 64 bit to live on. Have you read anything specific about this? I’d be very curious! Virtual C64 is on the list, yay! Gotta play jumpman junior at max speed with Metal2! Ha, ha, ha. With regards Metal requirements, do I understand correctly that it will run on a 2012 Mac Mini with Intel HD Graphics 4000 integrated graphics with 1GB shared DDR3 memory, but not on a 2010 Mac Pro with an AMD Radeon HD 7950 with 3GB dedicated GDDR5 memory? It’s not so much “it will run on” as which Macs support Metal, and unfortunately Metal support only goes back to 2012 Macs at best. So yes, you’re correct a late 2012 Mac mini supports Metal but not a 2010 Mac Pro. Dawn of War 3 is on the list but what about Dawn of War 2? I played this and runs very well on my iMac 2013 so I think Dawn of War 2 is also support Metal. If I wrong?